Over the weekend I was reading my local newspaper and checked the obits as I always do. This was the first time I have found a new family relation I didn't know about. The name Westby isn't that common. This person was born a Westby, but was listed under her married name. Maxine Marguerite (Westby) Boysen was 92 years old. She passed away on November 20, 2009. She lived so very close to me, and yet was such a stranger. If I had only known I would have gone to meet her. The obituary is full of information. Once I read the full article, I contacted another cousin of mine in Montana and asked if she was aware of Maxine and if she was related. I was so sure she was. I recently learned of cousin Westbys in Washington, and Maxine was born in Spokane. The response I received was, yes she is related! I was given further information explaining the connections. 1) Go to www.MyHeritage.com - you don't have to be a registered member to use this feature. Click on the "Celebrities and Fun"tab. 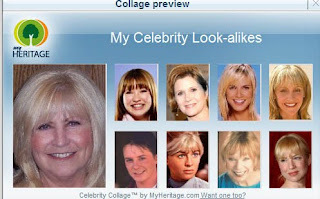 2) Click on the "Celebrity Collage" tab, and then on the "Create my Collage" button. 3) Upload a photograph with your face (or another person's face) to the site (the face must be at least 100 x 100 pixels) and click on the "Run face recognition" button. Happy Thanksgiving Family Tree Style! On this Thanksgiving day I would like to give thanks to a few of my ancestors from my family tree! Without them I wouldn't be here or have the family I have today! I am so very grateful! T ~ Thomas MINER H ~ Hjalmer LUNDBERG A ~ Alette Marie PEDERSDATTER N ~ Newell B. RICHMOND K ~ Knut Petter FREDRICKSEN S ~ Soren Marinus BLOM G ~ Gunner Olaf HANNSEN I ~Isabel Margaret FLEMING V ~ Viola HARDING I ~Ingvald WESTBY N ~ Nancy GILBREATH G ~ Gunner DULIN Thanks for stopping by! Wishing you success in all of your genealogical treasure hunts! Wordless Wednesday ~ Need a Coffee Cup? 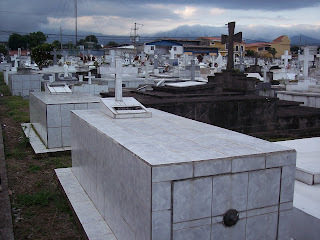 This is the resting place for my husband's uncle in Heredia, Costa Rica. This is the gravesite of the Benavides Hernandez family. In Costa Rica, the children are given the last name of the father and then the mother, hence "Benavides Hernandez." In Costa Rica my husbands last name was Benavides Benavides. This inscription shows that Ricardo Benavides passed away on June 27, 1996. This was my husband's mother's brother. I met him once, roughly five years before he died. Heritage Happens Received the Kreativ Blogger Award! I leave for a couple of weeks and come home to find I have been presented with an award! What a wonderful surprise! 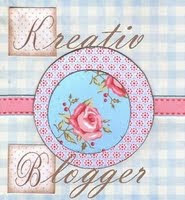 I have received the Kreativ Blogger Award not once, but twice while I was away! I wish to thank Deez from Cemetery Explorers and Gini from Ginisology for being so gracious to honor my blog! I am humbled, surprised and very thankful to you both! I am trying to think what I have done to be "Kreativ" as of late. I believe my posts "Those Places Thursday" would have to be at the top of this category. Although I have been away and today is Thursay, I will be getting back to those posts very soon! Upon receiving this award, I am suppose to list seven things about myself, so here goes!